Definitely Rustic. 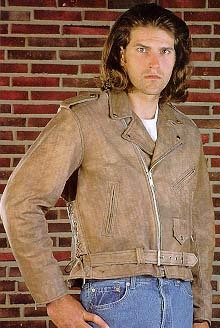 Ride with Pride wearing this Highway Patrol Jacket of distressed brown selected Buffalo leathers. Quality hardware enhances a stylish coat. Features 3 zippered front pockets, (2 hand warmer pockets and a slash chest pocket). Adjustable zippered sleeves. Flap watch pocket. Front 1/2 belt is sewn into the side seams, Inside pocket keeps personal belongings close to the heart. Removable Zip Out liner will allow the wearer to enjoy all seasons in comfort. Side lace adjusts against your body as needed for more comfort when riding and/or after a huge lunch. Snap collar stays down while riding. Epaulettes hold gloves or other accessories as needed. Bi-swing back gussets allow easy forward reach, neatly retracting while arms are in a downward position. Clean and condition these leathers with leather balm. You may use snow seal, or mink oil to weather proof . CAUTION: all conditioners will darken the color of this leather until they dry. Expect the variations of the distressing process to become more pronounced after cleaning and conditioning. Darkening of the leather on the neck or the sleeves from body oils is a natural occurrence as your body oils will keep the leather full of natural conditioners where contact is direct. Neutral cream or wax polish can be used to enhance the color. Sizing on these coats tends to be small. Order a size larger than your chest measurement for a snug fit and two sizes larger for a more relaxed fit. Style 016 is made of select Buffalo hides. Buffalo is a variable grain leather that will usually have natural scars and blemishes due to the wild nature of the beast. Panels of the coat may have slight variation in appearance...more of a distressed or retro look. Buffalo breaks in soft and fast. Look great in Distressed Brown. Color will darken as you condition it then lighten again as it dries. Most stores will price this coat at $169.99 to $219.99. When it first hit the market in 1982, it commanded about $249.99!